Who says you can't be fashionable when you go camping or hiking? The Montes Life sling bag proves that you can, no matter your surroundings. This classic vintage-style shoulder bag with brass and faux-leather detailing isn't just practical, it's also the height of fashion. 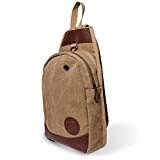 The soft, yet durable, canvas combines with the burgundy faux-leather detailing in a stunning design that tells the world you are the epitome of style. And yes, the trees do care how fashionable you are - we've asked. Featuring 3 separate compartments, this sling bag will allow you to carry all your necessities with you and find whatever you need easily. Additional interior pockets make it even easier to organize your belongings. Your phone is ringing? No problem. You know exactly where it is and can answer right away. No need to dig through a disorganized pile of stuff, because with the Montes Life shoulder bag, everything has a place. There's even a handy brass ringed hole to feed your headphones through so you can listen to your favorite music while on the move or even answer your phone without having to dig through your shoulder bag. Need to have quick access to your things at all times? No problem. Want to make sure you have free range of movement as your navigating a particularly treacherous piece of terrain? Again, not a problem. This sling backpack's comfortable mono strap allows you to wear the bag on your front or on your back, as the need arises. At 15 inches, this sling bag is the perfect size to carry your essentials with you. It's not so big that you can barely move, but not so small that you might as well just use your pockets. Durable canvas, solid brass zipper-pulls and quality workmanship ensure you'll have this shoulder bag for a very long time. So, click that Add to Cart button now and show everyone you know that you can indeed be stylish as well as practical thanks to your Montes Life sling bag. Review Price: Too low to display.